Let's keep these guys in the water where they belong. So this summer in NC we have seen a nice return of redfish. The new net regulations that were meant to protect the turtles have worked. I am seeing turtles in creeks where I have not ever seen them. I have been fishing these areas for 15 years and had never seen a turtle in some of them. They drastically cut back the amount of gear and the amount of time that gear can be fished and “Presto”, there’s a turtle. It’s not rocket science. Give them a chance and they will start to come back. As a nice side effect of this is the fact that redfish are around in nice numbers and staying around. In the past 4 years it was so bad, that if you found a school of redfish in a bay, creek or wherever, you could pretty much rest assured that after a day or two there would be nets wrapping up the whole place and the fish would be gone. You can’t tell me they have not been targeting them because I know what I saw. It’s obvious to me that somebody has been buying those fish. The guys were only allowed to keep 7 a day but there is no way they were doing that because they were wiping out whole schools and there would be no dead discards. That bust I reported on the other day is not even touching on the whole problem that was occurring. I say “was occurring” because it does not seem to be that way now as the fish are in the spots and staying there. They are not disappearing after a few days. We have been able to find them in the same spots all summer long. 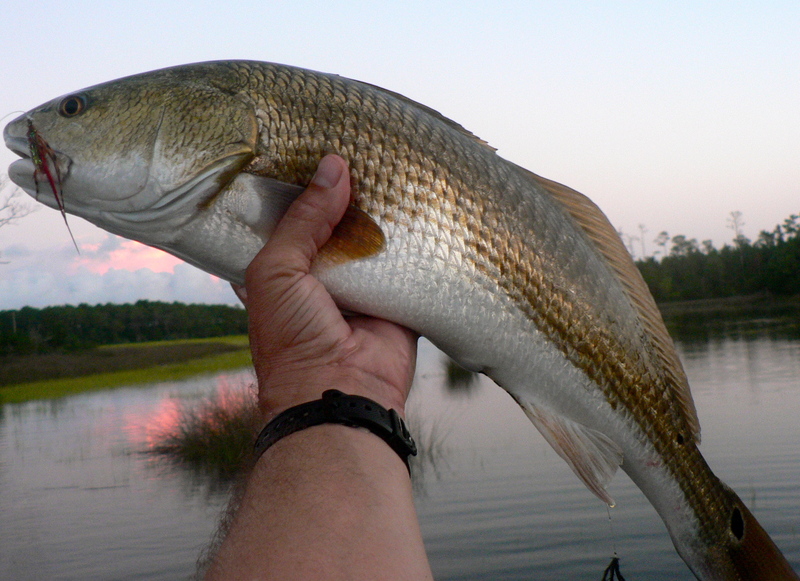 I have been able to watch schools of redfish smacking on shrimp day after day. Now here is where I am getting nervous. The gill netters are going to start crying to DMF…”There’re more drum than there’ve ever bin! You gotta let us ketch um! The turtles ain’t even in trubble. They’re all over out there!” They are going to pester and prod and demand that they be able to set their nets like they did in the past and take more red drum and the turtles be damned. They don’t care about fish in the water or wildlife being able to live, they want dead fish on the dock and the hell with anything that gets in the way. I don’t really blame the netters anymore. It’s the fish houses. The guys who buy the fish from the netters. Those guys keep the prices down artificially and it forces the netters to have to get more and more. The recent story on the convicted fish dealers is starting to open up some eyes. I am hoping that DMF stays the course and doesn’t give it all away, maintains their stance on net restrictions, keeps the current abundance of reds and allows the fish to come back all the way. The fishing is good this year and could be even better! I totally agree. i’ve seen turtles where i’ve never seen them before as well and in numbers. unfortunately where i fish, and have been fishing for years, rampant nettesr still target drum and have wiped out a school that was in there, as i was told by another source. I still catch drum but no where near like i did before. i pray that D.M.F doesnt allow the nets to come back like they were. i hope they stand firm now that they have put there foot down and keep it there.